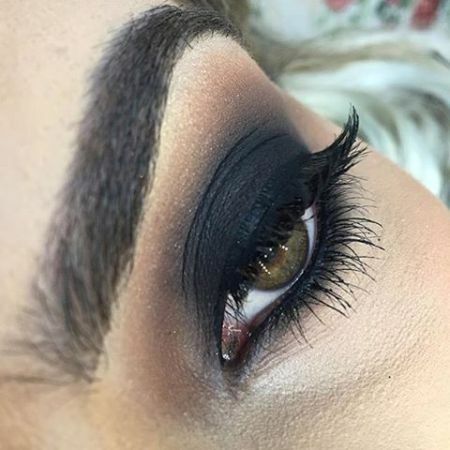 Dark Eye Makeup - Makeup in dark shades is a classic. It is always in fashion and will surely turn you into a gorgeous femme fatale. Use this makeup look for special occasions — for romantic dates, receptions, going to the theater, or to the restaurant. Keep in mind that this is an evening makeup look. It is not recommended for the office. However, sometimes it is difficult to define the boundaries of this rule. The solution is the following: if you think it is necessary to put on a party dress, then makeup in dark shades is appropriate. Dark shades of makeup look amazing in artificial light or candle light. It will make your look deep and expressive, and the eyes will flicker with mysterious shine from under thick eyelashes. In this makeup look, emphasis is placed on the eyes, so the lipstick should be a soft, natural beige color. 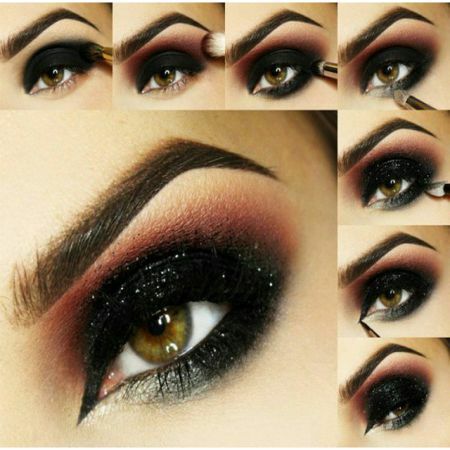 To create the makeup in dark shades look, you'll need black and gray eyeshadows, black eyeliner, and black mascara. You should be familiar with the preparatory stage by now, which includes cleansing, applying foundation, and eyebrow shaping. Once you've done this, you can proceed to the main part. First, apply black eyeshadow on the entire eyelid, but be sure not to go beyond it; otherwise, you will look like a panda. Because of this, we can “pull” the color only a little in the direction of the temples from the outside corners of the eyes. Next, apply a lighter (gray) tone. The transitions between the different shades should be smooth, so carefully blend the shades with a flat and rounded eyeshadow brush. Alternatively, for your second coat you can apply eyeshadows with a metallic shade. This is the trend of the season, which celebrities like the most. If you think black is too bold of a solution, you can try any other dark shades: dark purple, dark olive, dark brown, dark blue, etc. An important requirement, however, is that they have to be matte. Avoid tile-red shades as they can leave the eyes looking sore. Creating makeup in dark shades is quite difficult. The main thing here is to not overdo it and to comply with the measure. Do this and the results will exceed all your expectations! Like the article «Makeup in Dark Shades»? Share it with friends!